Groceries have traditionally been one of my family’s largest sources of landfill waste every week – all of that food packaging! Since we started incorporating more zero waste principles into our lives, we’ve been able to eliminate a huge amount of that waste. I thought I’d take a minute to share with you our shopping routines. 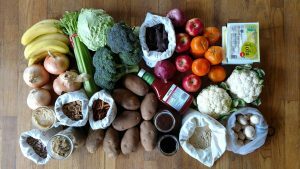 The main switch towards zero waste grocery shopping is that we now do the majority of our shopping out of bulk bins and the produce aisle, and at the farmer’s market. Santa Cruz, CA is really blessed with some amazing local grocery stores include Aptos Natural Foods, Staff of Life, and New Leaf, among others. We can shop for nearly everything we need in bulk at these stores. It just takes a little planning and prepping before we go out. In a typical week, we’ll buy lots of fruits and of veggies to sustain our breakfasts, lunches, and dinners. We buy the loose, unpackaged fruits and veggies, and use our produce bags, as well as some I bought at Whole Foods and on Etsy (before I started making them myself – there are lots of great shops on Etsy!). These bags weigh very little in relation to the produce, but you could write down their empty weight and ask the cashier to subtract it if you like. Fresh fruits and veggies are probably the easiest items for you to start purchasing without packaging. Fruits and veggies alone won’t sustain us for a week. Our proteins are generally eggs, tofu, cheese, peanut or almond butter, dried beans, and Annie’s cashew pimento spread – another local company and a delicious vegan cheese substitute! And we buy grains like bread, cereal, pasta, and oats, and we always need some snacks and sweets. And then there are usually some pantry staples on our shopping list like flour, spices, tea, oils, soy sauce, vinegar, etc. We are fortunate to find nearly all of these products in bulk in Santa Cruz – Staff of Life and Aptos Natural Food in particular have excellent bulk sections. In order to shop as close to zero waste as possible, I make a list of everything I will buy in bulk, and then make sure that I have the correct container for it. Check my instagram feed (no_trace_shop) for a picture of what I took to the store last time I went. I had to get 3 liquidy/gooey things last time including honey, olives, and peanut butter. I brought 3 jars and wrote what I needed on the lid of each, and the tare weight. I got the tare weight at home with a little kitchen scale – it gave me ounces but just divide the number of ounces by 16 to get the tare weight. 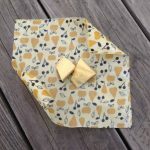 I also brought two beeswax wraps for the cheese. The deli staff will cut a chunk of cheese for you if you ask, and then I wrap it in my beeswax wrap instead of their plastic wrap. They usually give me a sticker, which I show to the cashier. I brought lots of bags for produce, fruits, grains, and other dry goods. And I bring my list and a pen so I can write down the bulk bin code for everything on my list. There are a few speciality items that require a special trip. When I shop at the farmer’s market, I can get eggs from a farmer, and I can also return any of my empty egg cartons to this farmer. I also get eggs from my in-laws during the sunnier seasons. Otherwise I get eggs at the store and save the cartons for my next trip to the farmer’s market. Sometimes we get chips from a taqueria – at least one taqueria in Santa Cruz will let you fill your own container with chips. We got a medium bag for about $3 last time. We also just started getting our ice cream from a local ice cream shop – Marianne’s. They do hand packed pints for $5.50. It is a bit more than what you get at the store, but you can bring in your own pint jar or take out one their containers, which are paper and 100% recyclable. Unfortunately, there are still a few things we can’t buy in bulk or from the farmer’s market. These include tofu (we recycle the packaging, though), Annie’s spread, salsa (although there might be taqueria that will let us buy this in our own container), maple syrup, Earth Balance (vegan butter), Veganaise (vegan mayo), mustard, ketchup, and yogurt. 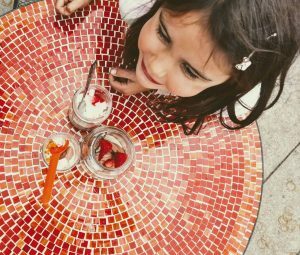 The worst of these is yogurt – we could easily go through a couple of plastic tubs a week. I’ve thought about making yogurt at home, but I am reluctant to add another task to my to-dos. We just started making homemade almond milk, though – that is really only 5 minutes! I’ll post on that in the future. We are making some good strides, though in our efforts to unpackage our foods. I think of it as an interesting mental exercise, trying to get as much as possible without packaging. I’ve also found that our cupboards are less cluttered, look much more appealing, and have very few processed foods in them. You can sneak a peek of our cupboards on my Instagram feed (no_trace_shop). That in itself is rewarding, and also prevents us from stockpiling foods and overlooking older purchases. Have you changed the way you shop for groceries? I’d love to hear about it! Share in the comments below. 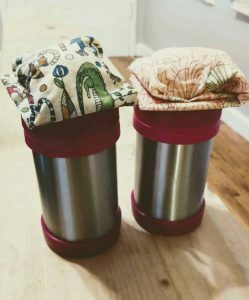 Inspired by role models from the zero waste movement, in 2015 I started to consider what it would take to achieve a zero waste life and household. Although I have recycled and composted the vast majority of my waste for the past 10 years, I still produce waste destined for the landfill, and the majority of this waste is food packaging. Since my effort to reduce waste in my home, I purchase most of my groceries from bulk bins and the produce section. I’ve also changed the way my family takes food on the go. I’ve made simple changes in the way we move through the world to reduce our footprint, inspired by the zero waste movement. 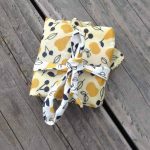 This includes using washable bulk bags, snack bags, and beeswax wrap. These three types of products help us reduce a huge portion of plastics and other destined-for-landfill materials from our everyday lives. In making this shift, however, I found that many of the products for purchase would eventually end up in the landfill. Reusable bulk bags with silk screen images, plastic tags, velcro, plastic buttons, polyester thread, or nylon lining (among others) – these will all eventually end up in the landfill. I found a need for reusable, washable products that, after their usable life is up, could be recycled or composted without introducing chemicals or other pollutants into the soil. I decided to start making products that would leave no trace. The manufacturing process also has the potential to create waste and contribute to pollution. No Trace’s manufacturing process includes using raw materials with minimal packaging, recycling any plastic packaging, and using fabric and paper scraps for handmade paper. 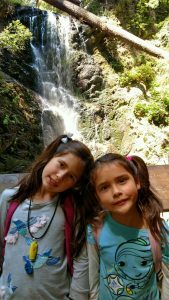 No Trace products are handmade in Capitola, CA with zero waste and made with all natural, renewable materials.